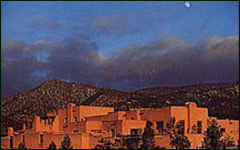 Jack Parsons - "Santa fe and Northern new Mexico"
The magnificence and awe of Northern New Mexico’s landscape has long proven a magnet for writers and artists, who have flocked here from around the world. Yet its profound beauty still defies description and even the most articulate have struggled to express its blend of sun and earth. D.H. Lawrence could only say, "For greatness of beauty I have never experienced anything like New Mexico. What splendor!" This landscape has been Jack Parson's home and subject for decades and, here, his presentation of it is uniquely successful. Roaming its mountains, deserts, pueblos, homes, and canyons, he captures breathtaking vistas of grandeur then balances these with intimate details. 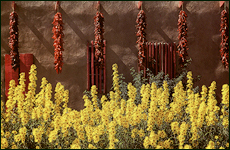 It is the small and exquisite details of life in Santa Fe – the vines climbing adobe walls, the Spanish portals with peeling paint, the weathered santos that stand guard over desert gardens – that continue to charm both artist and tourist alike. They are set in context by historian Christine Mather's text, as well as a special appendix that enumerates the region's special calendar of lively traditions.